Chief guest Prof. Daya Rohana Athukorala hands over a scholarship to one of the students. Also in the picture is CDB’s Managing Director/CEO Mahesh Nanayakkara. Citizens Development Business Finance PLC (CDB) recently launched its 'CDB Sisu Diri Season 04' for the fourth batch of children of three-wheeler owners who obtained the highest results at the Grade 05 scholarship exam and the GCE O/L examination. Fourteen boys and 26 girls from different socio income groups gathered at the Tower Hall Theatre with their parents to receive these scholarships worth Rs. 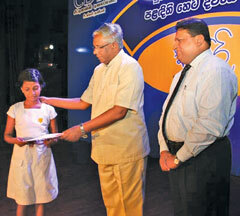 5m as part of 'CDB Sisu Diri Season 04', Sri Lanka's first-ever such scholarship program. The chief guest was Prof. Daya Rohana Athukorala. Grade 5 winners will receive an annual cash grant of Rs. 10,000 each until they complete their O/L examination. Similarly O/L winners will also receive an annual cash grant of Rs. 15,000 each until they complete their A/L examinations.